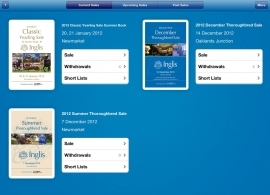 Inglis is pleased to announce the launch of the free Inglis Sales iPad app, giving clients cutting edge yet user-friendly access to Inglis Sales catalogues on their iPad. Catalogues for Inglis’ next three sales, the Sydney Summer Thoroughbred Sale, Melbourne December Thoroughbred Sale and Sydney Classic Yearling Sale Summer Book are already available for download on the new Inglis Sales app. The Inglis Sales app allows you to easily view and search for horses, create/edit short lists, make notes and assign ratings to each lot. The app goes further than all other options in the market to provide up-to-date sale results and pedigree updates as well as allowing you to 'make an offer' on a passed in lot. Designed to make buying from Inglis very easy, users of the Inglis Sales app will also be able to attach multiple photos and voice recordings to each horse. “All other existing catalogues apps are static from the time they are downloaded, which in the current market is not sufficient in terms of the quality of service Inglis strives to provide its clients,” said Inglis Managing Director Mark Webster. Daily pedigree updates ensure you are always kept up to date. Minimise the update by swiping it to the right. Sales results are updated in near real time allowing you to see what a horse sold for as well as make an offer on passed in lots straight from the app. Create as many Shortlists as you need and rename them to suit. You can then add multiple lots to a shortlist that meet your criteria. For example create a shortlist called “Filly with black type relation”, you would then search for all the fillies with a sibling with black type and add them to that short list. The Inglis Sales app allows you to Record Your Observations in a variety of ways. The first way to record your observations is by writing free hand notes and highlighting various parts of the pedigree using the pen and highlighter tools on catalogue page. The second way is using the customisable rating system to rate the pedigree. Inglis has included some default criteria such as size, strength, bone, score and conformation. Finally you are able to take photos using the iPads camera and make audio recordings of your thoughts on a pedigree. Share all your notes, ratings, photos and audio recordings on a specific lot via email by pressing on the share button on the catalogue page. You can also share entire shortlists on the shortlist screen via email. Apple iPad users running iOS 5.0 or later can download the FREE app at the iTunes store HERE.